AloTerra Restoration Services, LLC (AloTerra) is seeking a full-time Restoration Ecologist to provide project management and ecological restoration design services for a wide range of projects (i.e., river and riparian restoration, wetland mitigation, upland restoration, erosion control) for a diverse range of Federal, State, and local clients. The Restoration Ecologist must excel in working with engineers, regulatory agencies, landscape architects, biologists, public clients (i.e., coalitions and land management agencies), and private land owners. Application deadline is February 10, 2017. They are accepting applications until the position is filled. Link to full position description. Please send a cover letter, resume/CV, salary history, and three references (all as a single pdf or word doc) via email to: John Giordanengo, john@aloterraservices.com. No phone calls please. Volunteers for Outdoor Colorado (VOC) is seeking applicants to join their team in the 2017 Seasonal Project Manager Position. The Seasonal Project Manager works within the VOC program team and with VOC partners, volunteer leaders and project team members to provide professional project management, logistical support and volunteer leadership coordination on VOC volunteer projects administratively and in the field. Applicants must be available to start April 3rd, 2017. Applications must be received by 5pm February 10th, 2017. To review full job description, details, and application instructions, please visit their website: http://www.voc.org/join-our-team. No phone calls please. Questions should be sent to voc@voc.org. City of Boulder's Open Space and Mountain Parks (OSMP) is hiring an Education Supervisor. Under general direction, the Education Supervisor leads OSMP's Education Team. This position supervises staff ensuring opportunities for public involvement to fulfill department vision, mission, and initiatives. The role also requires close collaboration with multiple work groups, other city departments and external partners. Applications are due by February 12th, 2017. For more information visit their website at bouldercolorado.gov. The Colorado Outdoor Stewardship Coalition (COSC) is seeking a Project Management Contractor for its Statewide Stewardship Initiative (SSI). The SSI Project Manager/Management Team is a contracted position responsible for overseeing the planning, implementation, and tracking of the COSC Statewide Stewardship Initiative (SSI), a specific short-term project to be completed by March 2018. The SSI is funded through Great Outdoors Colorado (GOCO) with specified, date-sensitive deliverables. Applications are due by 5:00 PM (MST) on February 13th. For more information visit the COSC Website. South Platte Park (Littleton) is hiring a Park Interpreter for the summer season. This position is responsible for planning, researching, preparing, and conducting interpretive programs and summer camps for mainly groups of children, with some family programs. Also assists with Nature Center exhibits, animal care, volunteers, marketing and communication. This is a 40-hour position May 30-August 19 with part time hours required May 8-26. Application deadline closes on February 13, 2017, 5:00 pm Mountain. For more information go to South Platte Park Interpreter. Roaring Fork Conservancy is looking for a Watershed Educator to join their team of educators, who will help provide watershed education to students within the Roaring Fork Valley (from Aspen to Glenwood Springs) both in the classroom and in outdoor/field settings. This seasonal position is responsible for teaching water and river-related educational programming as part of Roaring Fork Conservancy’s Watershed Education program. For more information on this position click HERE. Please send cover letter, resume, and three references by February 15, 2017 to: Christina Medved, Education Director, christina@roaringfork.org. No phone calls, please. The Conservation Lands Foundation (CLF) is hiring a Senior Director for Development. CLF is a national non-profit organization headquartered in Durango, Colorado with offices in San Francisco, Albuquerque, Bozeman, Las Cruces, Joshua Tree, and Washington, DC. The Senior Director for Development is part of CLF’s senior leadership team and works collaboratively with the Board of Directors, Executive Director and colleagues to develop and implement fundraising strategies to achieve annual income and programmatic goals. The ideal candidate is an experienced fundraiser with a proven record of accomplishment managing successful campaigns, cultivating relationships with donors, securing major gifts from foundations and individuals, and managing a high performing team. Send a cover letter and resume to directorfordevelopment@conservationlands.org. No phone calls, please. For more information on CLF visit their website at conservationlands.org. The Continental Divide Land Trust, located in Summit County Colorado, is looking for a ~3/4 time Program Coordinator to staff the daily functions of the organization. The position answers directly to the CDLT Board and runs the office in Breckenridge. Please contact Kim Dufty, Board President, at Info@cdlt.org or 970-453-3875 for more details. 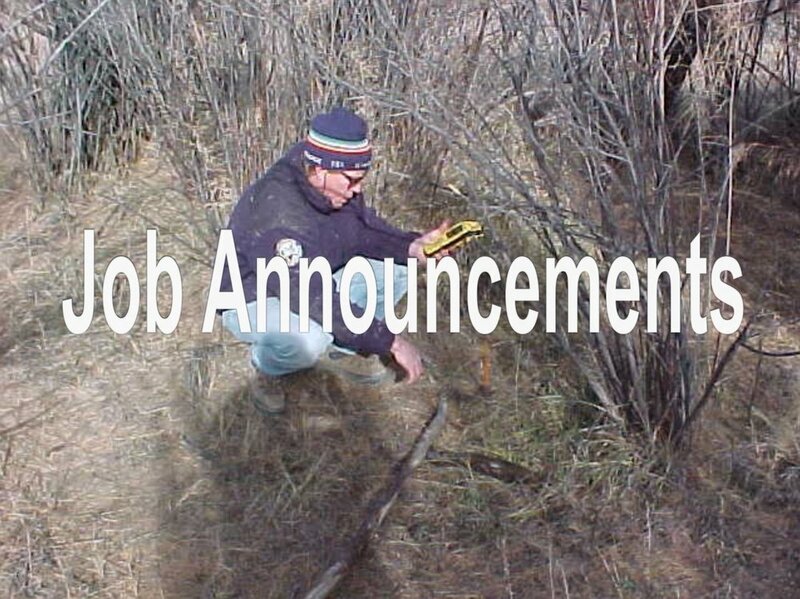 Denver Parks and Recreation (DPR) is seeking professionals for the position of Urban Forestry Utility Worker (On Call) with their Office of the City Forester. You will work as a forestry crew member, assisting Arborist Technicians working aloft, raking, clearing branches, and setting up safety work zones. This role is a great fit for anyone interested in aboriculture. Denver's Office of the City Forester is housed within the Park and Recreation's Natural Resources Division and is internationally renowned for its innovative management of Denver's community forest. For more information click HERE. The Boulder County Youth Corps is now hiring Boulder County teens ages 14-17 to fill 160 Corpsmember positions and adults for 34 Leader openings to work all over Boulder County. Corpsmember applications will be accepted through Friday, March 31, and girls are encouraged to apply. Leader applications from those 18 and older will be taken until all of the positions have been filled. Challenge yourself this summer by joining the Youth Corps! Find more information online at www.BoulderCounty.org/YouthCorps.